Long time Southwest jewelry icons Jimmy Calabaza (Ca’Win) of Santo Domingo Pueblo and Navajo artists Carl and Irene Clark of Arizona will be featured in a major exhibit of contemporary native jewelry at Peters Projects, 1011 Paseo de Peralta, Santa Fe, NM, beginning with an opening reception Friday, August 17th, 2018, 5-7 p.m.
Jimmy Calabaza whose native name is Ca Win, has won six first place awards at the Santa Fe Indian Market. A self-taught silversmith, in the late 1980’s, he began creating necklaces with a silver side box which have now become internationally known. He works in both natural and stabilized turquoise. He prefers to do his own cutting, which means taking rough stones and shells and then fashioning them into polished products. Jimmy’s choice for working with large raw stones and following the natural lines of the material is that it allows each piece its own identity and uniqueness. As Jimmy has said, “It’s about preserving the art, with your hands, your heart and your head.” Calabaza also fashions superb bracelets, bolo ties, rings and earrings of blue turquoise, coral and other precious stones. Navajo jewelers Carl and Irene Clark are famous for their extremely fine quality jewelry. Detail is the term that best describes their legendary micro-fine inlaying technique. As Carl Clark states, “I learned all of my silver-smithing and inlaying techniques by trial and error without a teacher. Since there was no category for my type of inlay back then, in the early 1970’s, I classified it myself as ‘micro-fine intarsia.’” Carl then taught his wife, Irene and subsequently their son, Carl Jr. the Clarks come from large families that also include jewelers, painters and rug weavers. Carl was born in Winslow, Arizona and is from the Manygoat-Redhouse Clan. The Rainbow Man Yei, the image found in most of their inlays, represents a “jewelry of protection” theme. “Artistically speaking, we use the inlay as a picture and the metal work, whether silver or gold, as the picture frame.” The Clarks developed the idea of the image or picture as a micro-fine native rug design and the color blend is an authentic and original technique that suggests a “day into night” quality. 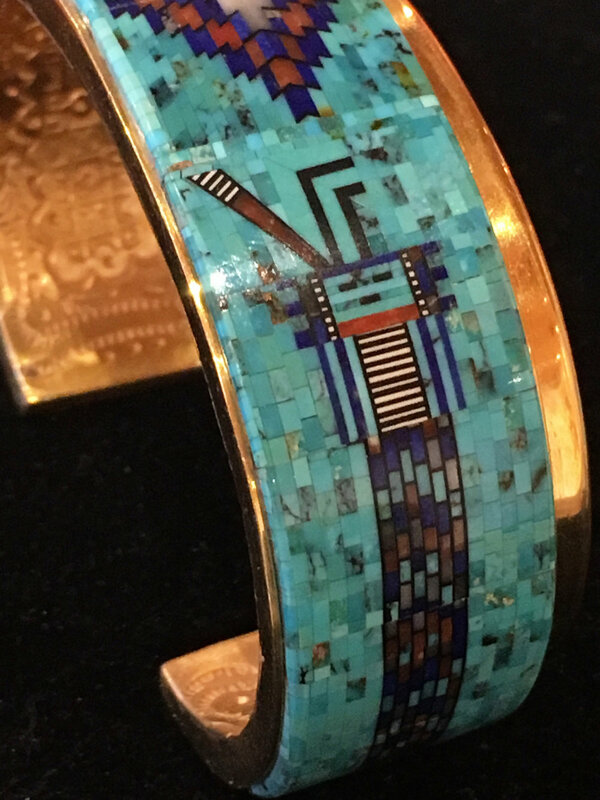 For the last 30 years, the Clark’s work has been shown in all of the major southwestern native jewelry shows including the Heard Museum and Santa Fe’s Indian Market. They also show their work in museums and galleries throughout the southwest and New York City, and have won many awards for their original work. They have also been featured in many books and other publications including Southwest Indian Jewelry by Dexter Cirillo and Enduring Traditions by Lois and Jerry Jacka. In the adjoining gallery space, the Gerald Peters Gallery bookstore will feature their large inventory of Native American art books, both in and out-of-print.